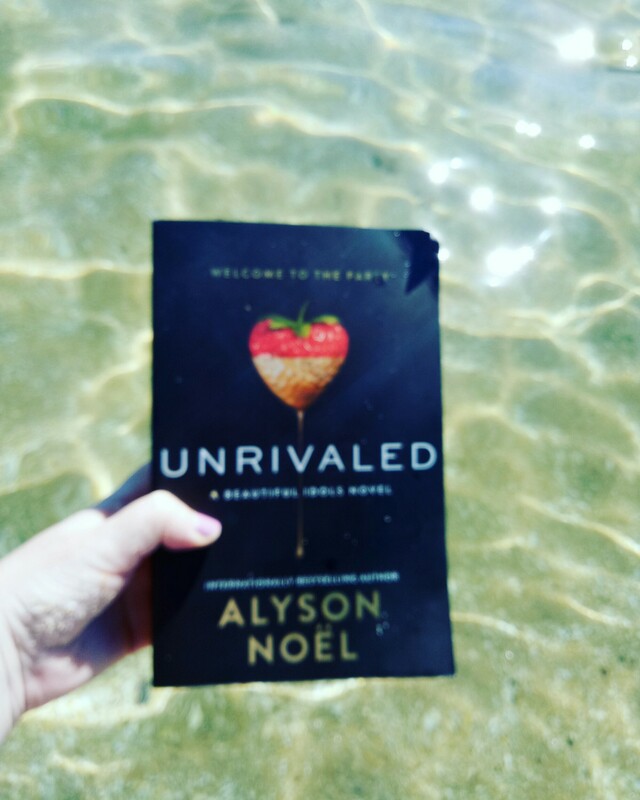 Unrivaled is the first novel in the Beautiful Idols trilogy by Alyson Noel. The novel focuses on three people vying to win Ira Redman’s Unrivaled Nightlife promo competition. Ira owns several Hollywood nightclubs and the competitors score points based on how many celebrities they can bring into Ira’s clubs and how famous those celebrities are. Layla dreams of becoming a journalist but currently runs a celebrity blog called Beautiful Idols. Aster feels stifled by her wealthy but conservative Persian parents and aspires to become an actress. Tommy has just moved to Hollywood from Oklahoma and dreams of becoming a famous guitarist and showing up his father who doesn’t even know he exists. Madison Brooks is a star actress and worth the highest amount of points in Ira’s competition. As the novel progresses it becomes clear that there are dark secrets in Madison’s past. Madison’s story is where the mystery comes into play. Unrivaled is a really fun read, perfect to take with you to the beach. There is quite a lot of character development and back story throughout the beginning and middle of the novel and a bit of a slow buildup before all the action starts to take place. This is something I enjoy but I think some mystery fans might find it a little bit too slow for them. I also loved that the chapters are all named after songs. I found that fit in really well with the Hollywood setting of this novel. There is quite a lot of character development and back story throughout the beginning and middle of the novel and a bit of a slow buildup before all the action starts to take place. This is something I enjoy but I think some mystery fans might find it a little bit too slow for them. The action starts to heat up towards the end of the novel, just in time to leave you dying to know what happens after the crazy cliffhanger. I’ll definitely need to check out the next book in the series to find out! Beautiful, flaxen-haired Buttercup has fallen for Westley, the farm boy, and when he departs to make his fortune, she vows never to love another. So when she hears that his ship has been captured by the Dread Pirate Roberts (no survivors) her heart is broken. But her charms draw the attention of the relentless Prince Humperdinck who wants a wife and will go to any lengths to have Buttercup. So starts a fairy tale like no other, of fencing, poison, true love, hate, revenge, giants, bad men, good men, snakes, spiders, chases, escapes, lies, truths, passion and miracles, and … a damn fine story. The Princess Bride is possibly the only time I ever saw the movie before I read the book. I must have watched the movie about a million times, as did most 80s kids, so I was a little bit apprehensive about reading the book around the wrong way after such a long time. I didn’t have anything to worry about because I enjoyed the book just as much as I loved the movie. I couldn’t help but picture the movie characters as I was reading, but I found that most of the action and classic lines in the novel were portrayed accurately in the movie. I found Goldman’s fictional great Florinese author, S. Morgenstern, and his “classic tale of true love and high adventure” an interesting technique. It’s definitely an interesting way of skipping through all the boring bits and adds an air of excitement to the story.